I have loved and enjoy reading Sword of the Guardian and have been waiting for this "sequel" ever since. The writing is just superb, reading the book, you can almost feel Kade's out of the world experience with Ithyris, everything is described so vividly right in front of your eyes. Admittedly, I've tried to take a peek at the end of the story and lol.... glad to say for once that there are so many different twists and turns that I end up starting again at where I've left off. To some, Kade will be an unlikely heroine - timid, uncomfortable with attention and tears easily. To me though, Kade is just perfect as the way she is - loyal, selfless and holding such faith and inner strength despite everything that's happening. Erinda and Kade's story is sweet, heartbreaking and endearing. Their love, connection and devotion to each other transcends time and boundaries, I think they're just destined to be together. Highly recommending this if you've enjoyed the author's previous work or is a fan of the fantasy genre. 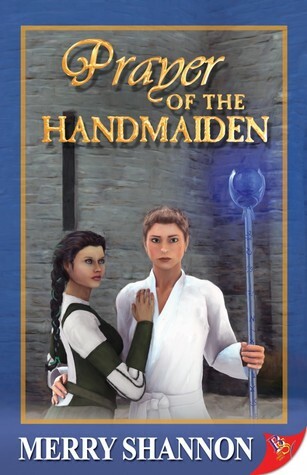 Sign into Goodreads to see if any of your friends have read Prayer of the Handmaiden.